I caught my first glimpse of the distinct peaks (Torres) from Lake Sarmiento, an interesting lake that looked as if it had a ring around it. Leading up to Lake Sarmiento, we passed the Deciduous Magellan Forest with poplar and conifer trees but mostly dominated by Lenga trees. Then on to Patagonian plains and plateau covered in pampas and walled by rocky hills: a landscape said to be lower than sea level and created by glacial movement. And of course, the famous symbol of anything Patagonia, the horn-shaped towers (the jagged mountain peaks) dominated the horizon and could be seen from all directions. With the changeable weather, the snow-capped mountains suddenly appeared with glorious blue light or buried under a shroud of dense, gray clouds. The sky was vast and dominating. Milky aqua waters of Rio Paine and lakes were part of the surreal landscape. While I expected to see glaciers near the mountain, I was surprised to see some vegetation, flora (yellow lupines, Calafate/blueberry) and fauna (wild turkey, geese, and neandus). Guanacos dominated the animal landscape. Torres Del Paine National Park is a UNESCO Biosphere Reserve. It is a massif, a mountain system independent of the Andes mountain range in Patagonia. It centers on an alpine massif of three imposing granite towers (Torres) reaching more than 10,000 feet, together with several lesser horns, or cuernos, formed of black shale, and a variety of glaciers, lakes, and wild rivers. Here's a video of my Patagonian adventure (long version). Click HERE to watch it on YouTube or click the thumbnail below. 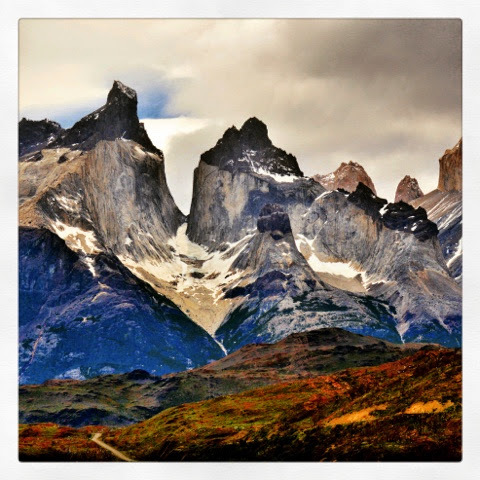 Press play to watch a short preview of Torres Del Paine.